For those of us who teach during the year, summer is the perfect time to learn and develop our own musicianship skills and catch up on some professional development. Summer conferences are a great way to do this. They help us stay connected with others in the field; learn new things about playing, singing, directing, and teaching; find inspiration for creating meaningful and engaging worship services; and hear about all the latest music releases: choral, handbell, children's choir resources, curriculum, instrumental collections, etc. Today (by popular request! 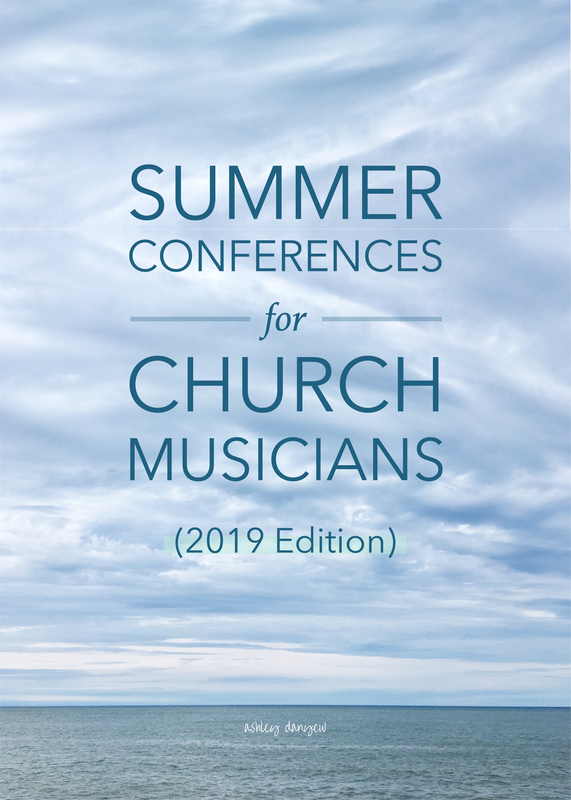 ), I’m sharing a few summer conferences and events that are specifically geared toward church musicians, directors, accompanists, choir members, students, worship leaders, pastors, liturgists, and everyone in between. I hope you find one that’s a good fit for you! Montreat is held in June every year, with two weeks to choose from. I’ve never attended, but I know several people who have and rave about it. "Today’s society is torn amid conflict and chaos, and so often Christ’s promise of peace feels unlikely or even impossible. How is our perspective as followers of Christ changed by this promise? How do we receive God’s peace in the midst of chaos?" I’ve attended Music & Worship Arts Week (MWAW) for many years and always learn something new. Their worship style is blended and they have choirs/ensembles and seminars for all ages, including leveled handbell ensembles, an acting group, a dance troupe, and an intergenerational instrumental ensemble. I always enjoy observing the choral clinicians and attending their afternoon seminars. There are also several reading sessions throughout the week from a variety of different sacred music publishers. P.S. I’ll be at MWAW this summer, playing for the Younger Elementary Choir and one of the reading sessions! Will you be there? This biennial conference is intended for churches of all sizes and in all types of settings. Includes: worship and prayer services, reading sessions, and several workshops and plenary sessions. "Simplicity. Shared song. Central things. Silence. Hospitality. These are marks of liturgical and musical reform that swept through the churches during the 20th century and gave birth to the service books and hymnals now used throughout North America. These marks continue to challenge the leaders of the assembly’s song who strive to do common, shared things, uncommonly well." This annual conference includes worship services and hymn festivals, an organ recital, and a variety of plenary and workshop sessions. “The Hymn Society Annual Conference is a 5-day event each July that features three plenary speakers, 5 hymn festivals, and many breakout sessions that all focus on congregational singing." Geared toward handbell ringers and directors of all experience levels, the conference includes a few different tracks to choose from and a variety of educational classes and inspirational performances. "At the Zephyr Point Handbell Conference there are opportunities for ringers of all levels. Each day, participants have the chance to break up into smaller ensembles – the ‘Mountains’ and the ‘Lakes’ – under the exceptional leadership of a skilled team of handbell directors and composers. There is also a slate of additional optional classes for participants to choose from to help them improve in specific ringing skills. Daily mass rehearsals help all ringers prepare for the final rehearsal in which everybody participates making incredible music, all on the majestic and inspiring shores of Lake Tahoe!" This annual conference features worship and music, ensembles for all ages, and a series of classes, reading sessions, forums, and workshops. "Threads from Daniel C. Damon’s hymn, 'Together We Serve,' will be woven together to make our conference theme in 2019 . . . . We will explore what it means to follow God’s light into the dark corners of our world. Through song, worship, teaching, fellowship, and much more we will reimagine what it might mean to strengthen Christ’s ministry through service as a community of faith in times and places of difficulty." "The [3-stage] certification process is designed to strengthen directors’ musical and pedagogical skills and to equip them to effectively integrate children in worship . . . . A degree in music is not required, but musical literacy is fundamental to success as a participant in the Choristers Guild Institute." Jump-start your choir year with helpful music education resources designed specifically for you. Sign up for a self-paced online mini course and learn from the comfort of your living room! Start whenever you’re ready and work at your own pace. Created specifically for children's choir directors, this self-paced 4-week online training course will help you develop practical skills and useful step-by-step processes to plan, direct, and teach children's choir on a weekly basis, and grow your choir ministry. Topics include: fostering spiritual growth, planning the choir year, choosing music, working with children’s voices, creative teaching strategies, developing musicianship and introducing music-reading, and more. Designed for adult choir directors in church settings, this self-paced 2-hour mini course includes a brief overview of relevant educational theories about how adults learn, and a variety of practical tools and resources you can use in your ministry and teaching. Topics include: vocal technique and choral methods, developing music-reading skills, choosing music, and rehearsal planning. Develop the essential skills and teaching strategies you need to direct with confidence in this 2-hour mini course. Topics include: working with changing voices, choosing music, planning rehearsals, and creating meaningful experiences. Designed for handbell choir directors in church settings, this course will equip you with the practical tools and resources you need to lead and teach with confidence. Topics include: getting set up, care and maintenance, instrumental technique, developing sight-reading and music-reading skills, working with non-music-readers, choosing music, planning rehearsals, and working with children's handbells. Where are you headed this summer? What skills do you hope to learn or develop?